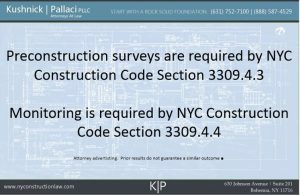 If you are performing construction work in New York City there is a very good chance that you will have to perform a preconstruction survey and/or perform monitoring of neighboring properties. The preconstruction survey and the monitoring often go hand-in-hand. The preconstruction survey will identify the existing conditions of neighboring properties before work starts. The monitoring protocol will provide a means for keeping an eye on the adjacent buildings to determine whether there is any movement or vibration that could or is causing damage. When is a preconstruction survey required to protect an adjoining property? When is monitoring required to protect an adjoining property? 1.Buildings that are within a distance from the edge of the excavation that is equal to or less than the maximum depth of the excavation. 2.Historic structures that are contiguous to or within a lateral distance of 90 feet (27 432 mm) from the edge of the lot where an excavation is occurring. 2.Where the excavation occurs within five feet (1524 mm) or less from a footing or foundation, such excavation does not occur below the level of the footing or foundation. How do I get access to perform a preconstruction survey and install monitoring? Naturally in order to perform a preconstruction survey and install the requisite monitoring you will have to enter your neighbor’s property. But you can’t just trespass on your neighbor’s property. You need permission to enter the property, perform the survey and then install the monitoring. Where a construction or demolition project will require access to adjoining property in accordance with this section, written notification shall be provided to the adjoining property owner at least 60 calendar days prior to the commencement of work. Such notification shall describe the nature of work, estimated schedule and duration, details of inspections or monitoring to be performed on the adjoining property, protection to be installed on the adjoining property, and contact information for the project. Where no response is received, a second written notification shall be made no more than 45 calendar days, and not less than 30 calendar days, prior to the commencement of work. rest upon the owner of the adjoining property involved; and in case any tenant of such owner fails or refuses to permit the owner to afford such license, such failure or refusal shall be a cause for the owner to dispossess such tenant through appropriate legal proceedings for recovering possession of real property. Nothing in this chapter shall be construed to prohibit the owner of the property undertaking construction or demolition work from petitioning for a special proceeding pursuant to Section 881 of the Real Property Actions and Proceedings Law. What if my neighbor ignores the request to enter an perform the survey and monitoring? Section 3309.2 of the Code says that the neighbor (the adjoining property owner) has the responsibility for affording a license to enter. If a license agreement can be agreed upon that ends the discussion. But if a license agreement cannot be agreed upon, then Section 3309.2 says that the “owner of the property undertaking construction” can petition the Court pursuant RPAPL Section 881 for a judicial license. While many construction projects go smoothly and their is cooperation, many result in litigation. The preconstruction survey and the monitoring required by Code Sections 3309.3 and 3309.4 actually protect both the developer and the adjoining property owner in litigation over damage caused by the adjacent construction. The preconstruction survey provides a baseline for the attorneys to know the condition of the adjoining property before construction and the monitoring provide scientific data for whether the adjoining property moved (or vibrated) during construction (which may have caused damage). 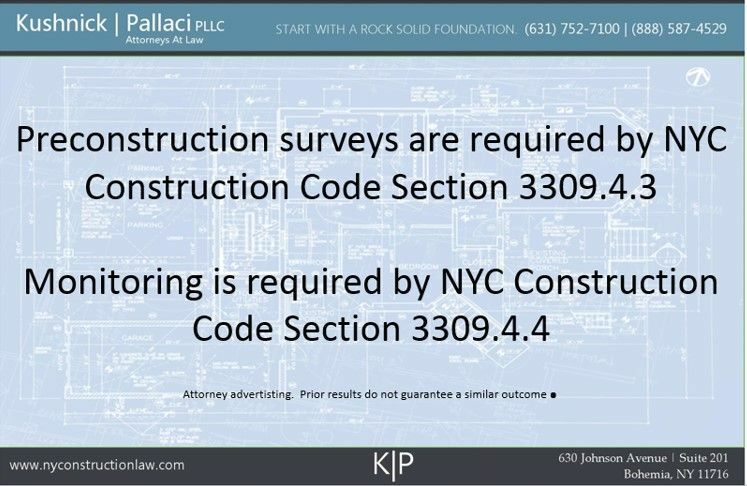 The construction attorneys at Kushnick Pallaci regularly prepare construction license agreements and litigate RPAPL 881 proceedings and claims over damage from adjoining construction. You can contact one of our attorneys here to discuss your potential claim. This entry was posted in Adjacent Property Construction, Building Code, Construction License Access Agreement, Construction Litigation, Defective Construction and tagged Access Agreement, License Agreement, monitoring, preconstruction survey by VTP. Bookmark the permalink.